Taking a cue from knowing what you stand for can give you and your company the confidence to start thinking outside of the box and looking for opportunities that may not have been apparent without the clarity you have now achieved. What would we do if money were not an object? What are the diamonds in our own back yard? How can we improve on our products, our services, our systems, our processes? What are we passionate about as a company? What would we do differently if we could start over? Is there a problem in our industry for which we could provide the solution? Take the answers to these questions and mine them for ideas that have the capacity to take you to the next level. Remember – it doesn’t have to be complicated. Just a better way. Consider the story behind Warby Parker. Warby Parker is a company that believes that every idea starts with a problem. Theirs was simple: glasses are too expensive. When they realized that the eyewear industry is dominated by a single company who has been able to keep prices artificially high, they decided to create an alternative. Their lofty objective is to offer designer eyewear at a revolutionary price and lead the way for socially conscious businesses. How can your company rise above the clouds? 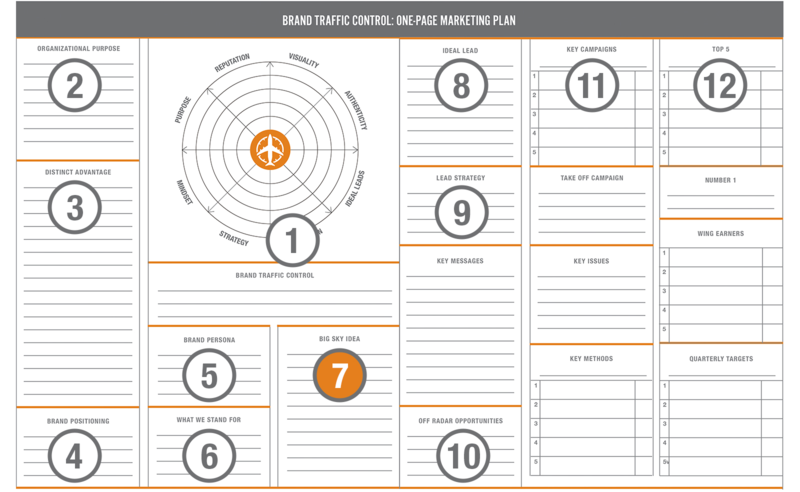 To download The One-Page Marketing PlanTM , click here.